Muttville is a San Francisco-based rescue group whose mission is "to provide rescue, foster, adoption, and hospice for senior dogs, and support and education for the people who love them." Muttville has placed over 1,300 dogs since its founding in 2007; all dogs are over the age of seven, and half have age-related health issues. Who adops these dogs? Maddie's Fund® spoke with founder Sherri Franklin to find out - and potentially unlock the secret to achieving a no-kill nation. 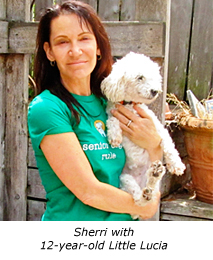 Q. Sherri, describe a Muttville dog. A. Our dogs must be seven or older and not aggressive. Many are small, but we also take Labradors and other large breeds. About half of our dogs are in great health and about half have medical issues. Some have cataracts or other eye conditions that require daily meds; some are blind. They may have heart murmurs, kidney disease or dental disease. We do dentals on probably 95% of our dogs. Our dogs come from California shelters and rescues. We do take some owner-surrendered dogs, but generally this occurs when someone has to go to a nursing home. Q. So who are your adopters? What motivates people to adopt from you? Rescuers. These folks, about 30% of our adopters, want the hardest cases. They ask for the dog who has been with us the longest or who is in the worst shape. Families. Families want a tried and true dog, a dog who has been in foster care so they can get a lot of information about the dog's temperament. Many families don't want a puppy - they don't have time to train one. We hear a lot of our parents talking to their kids about empathy, compassion, and how to care for an animal as they get older. Saving a special dog is a message they are trying to send. Seniors. Our senior-to-senior program is our signature program. These folks definitely don't want a puppy or a dog who needs tons of exercise. They are looking for a lap dog or dog who has been around older people. Many older people come to us through their kids: 50-year-old kids looking for a dog for their 70-year-old mothers to keep them from being lonely. Older boomers are looking for dogs for themselves. Younger people or students. People in their 20s don't want a 15 - 20 year commitment. They don't know where they'll be living in five years but do want a dog in their life. This age group has grown up with the idea that they want to rescue and we've had a really good track record with young adults. They love their first dog and are very committed. And there's a whole group in the tech world who can bring their dogs to work. We have dogs at Zynga, Advent, and other tech companies. Singles who want a companion. Again, a lot of people don't want a young puppy; they want some background on the dog so they know what they're getting into. Q. Do adopters worry that your pets will incur a lot of medical expenses? A. I would say this is the biggest drawback and the reason why people are afraid of older adoptions. We do vet checks and full blood panels on all of our animals and this alleviates a lot of concern. We believe in full disclosure - we reveal everything we know about the animal's medical condition. If the dog will need eye drops for life, we tell people. If he has a heart murmur, we tell them. The adopter will know everything we know when they adopt and we try and get all of their questions answered. Q. How do adopters find you? A. I would say about half our adopters come to us through Petfinder.com or similar websites. The rest come either from seeing us in the media, out in the community, or from word of mouth. Our adopters and foster parents are tremendous advocates and some of them have really loud voices. We give all of our foster parents "adopt Me" vests and Muttville business cards, so our dogs get a lot of exposure around the city in dog parks and so on. We also have outreach events every weekend where we invite people to come and sit with our dogs. One little girl held a dog for three hours - her father adopted him. Many of our adopters are repeat customers. Q. Do you get a lot of love letters from adopters? A. All the time. I get at least one email or letter per day. We also get love letters when dogs pass away - people writing how much the dog meant in their life. Q. Is customer service part of your success? A. Definitely. We get at least 500 emails per day and I personally answer 200 - 300 of them. While volunteers are playing with dogs, I'm at the computer! I firmly believe that responding promptly and letting people know you care is really important. 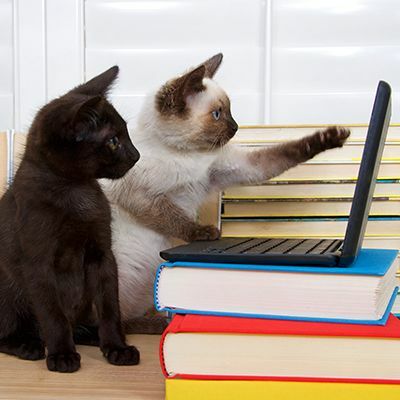 We also try to foster a sense of community by sending our adopters email announcements, tips and advice. 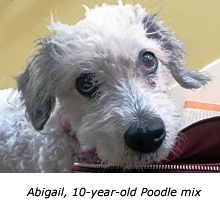 We ask for stories about their dogs and post them on our blog, and we create Muttville events. Last Christmas we held a walk at Fort Funston and 50 Muttville dogs showed up. One of our adopters says we should call ourselves "Muttville Nation". Q. How do you find your fosterers? A. Our foster families are critical. We have a total of 75 foster homes - 45 are active at any particular time. We recruit through Craigslist and Facebook, put up signs at veterinary clinics ("Save a life, foster a dog with Muttville"), and ask our foster homes to spread the word about fostering. Q. Muttville's mission is to change the way the world thinks about and treats older dogs. Do you think you have made a difference in this regard? A. We have marketed the wonderful love of senior dogs loud and clear. We've helped get the word out and I think we have made a difference. Five years ago, we were the last resort for senior dogs. Now we're starting to see senior adoptions at shelters. We'll say, "We're able to take that 10-year-old dog now," only to hear he already got adopted at the shelter! I think we have helped make being a senior pet a positive, not a negative. Q. If you were consulting with executive directors at animal shelters, what would you advise them to do to boost their senior adoptions? A. I would recommend doing a full health screening and advertising that fact. 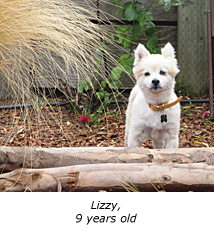 It's too scary for adopters to have so many unknowns about an older dog. 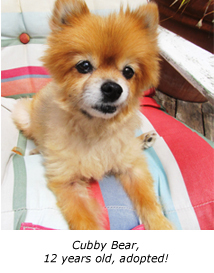 I would also start a senior foster program so that adopters can get more detailed information about the dog. That way, a family who has lived with the dog can say, "Great with kids," or "Great with cats," etc. Q. What would you say to those who believe no one wants the kinds of dogs you have? A. I think everything I've told you proves that simply isn't true. Thirteen hundred adopters will back me up on that. Q. And finally, how did you get on Oprah? A. As I mentioned before, Muttville friends have loud voices. One of our volunteers was on Oprah's site and read, "Has somebody changed your life?" 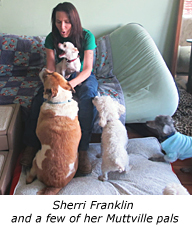 She wrote how she adopted Frankie, how great Muttville is, and how volunteering for Muttville gave her purpose. Within a week she got an email, "Would you and Sherri Franklin come to the Oprah show?" We were one of 200 people and organizations who were celebrated as Oprah's heroes. More recently, the San Francisco Giants Cy Young Award-winning pitcher, Tim Lincecum, chose us as his favorite charity. We were honored at a Giant's pregame show and Tim signed a lot of things for us to auction off. Most people pick charities to help children, so I asked him why he chose us. "It was a no-brainer," he said. "I love animals."